In the western world, I’ve always been happy to use public transportation, if possible. My vision of an ideal lifestyle is one where I don’t need to own a car – a place where I can walk, bike or take efficient and practical public transit to all the places I regularly need to go. In the small American cities I grew up and went to college in, the efficient public transit option did not exist. In the mid-sized city of Tacoma, WA which I now call home in the U.S., well, it was only slightly better (i.e., there’s more public transit, but it’s not very efficient or practical). When I spent 6 months living near Paris and studying in the city, now, that was great ! The train network, the metro, the buses, with something running at all hours of day and night. The greatest challenge was paying attention to the strikes and demonstrations that often interrupt the schedule, but the system moves a lot of people with remarkable efficiency. Now for West Africa. Public transportation is a great need here in this capital city of over a million people. But the need is not met by taxpayer-funded infrastructure projects. Rather, it’s met by hundreds of small white taxi cabs (with some Toyota vans in the mix, too, for larger crowds). The taxis can function like a bus system in an American or European city, or in the same way as taxis do in the cities I’ve lived in before. That is to say, there are some designated spots in the city where lots of cabs organize based on which part of the city they’re headed to (like a bus stop), and each vehicle fills up with 4 passengers in each car who pay a low fare. Or you can go to any main road, flag down a taxi and tell the driver where you want to go (Like one would in New York, DC or Chicago). If he’s already headed somewhere else, he may tell you he’s not going to your destination. Or he may just drive away without saying anything, leaving you to deduce that he wasn’t planning on going to your destination. When you flag someone down, he’ll usually stop along the way to pick up other people, assuming their destinations are along the same route. You can also use taxis the way people do in smaller cities in the U.S. : you call and ask them to pick you up. If you know a taxi driver that you like, then you keep his phone number handy for those times when you need him to come get you from home and take you somewhere that’s not on a « standard » route. That, of course, is the most expensive option. But if I want to take our whole family of four somewhere, (or bring the five chairs I just bought back home with me, for that matter), well, it requires paying a little bit more. Of course, humans are not the only live passengers in this transit system. I climbed into the back of one taxi last week and greeted the driver and the lady riding in the front passenger seat. The baby she held in her arms stared wide-eyed at me, the white skinned stranger. Distracted by the baby, I did not notice the other passenger in the vehicle, until I heard a bleat just behind me. 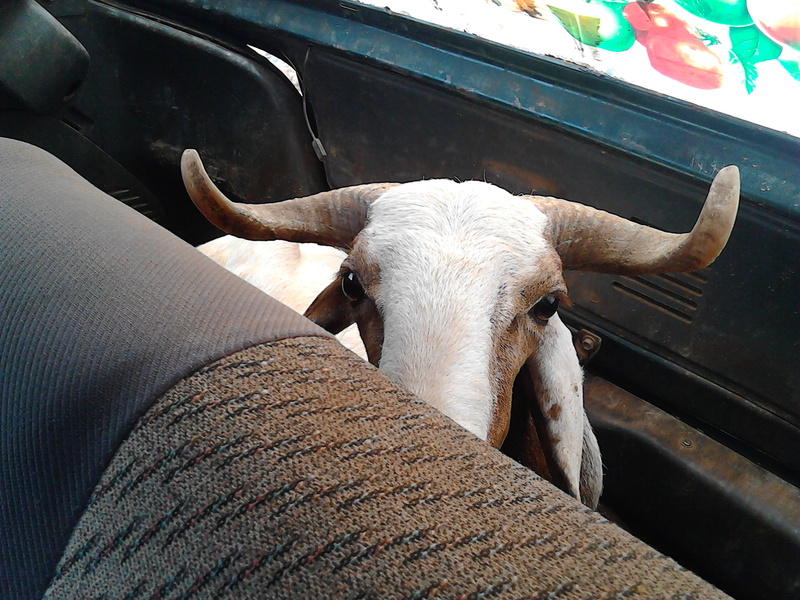 Then I turned my head and saw the curled horns of a ram in the back of the cab. When we reached the first stop, the cab driver climbed out to lift the sheep out of the hatchback and untie his legs. I remember seeing a news story about how the passengers on a commuter train in a Canadian city complained and were highly disturbed that a lady riding in their car was plucking a freshly slaughtered chicken during their train ride. I imagine that would not cause such an uproar here. My very first taxi ride in Africa took much longer than normal for the distance traveled. I wasn’t going very far away, but I got to experience one of the perks of living in the capital city – waiting for the presidential motorcade to pass (groan!). Thus what should have been a 10-minute drive turned into an hour of waiting. The taxi driver was patient – even though I was his only passenger, he waited to get me to my destination. He wanted to earn a long-time customer who might pay the higher rate for pick-ups from home. It turns out he speaks French (the official language, but not the most widely spoken) well and drives carefully. Neither of those two things can be taken for granted here. But then, come to think of it, that seems to be pretty consistent in general around the world (or at least a common complaint around the world) – taxi men who have a reputation as very aggressive drivers, but don’t always speak the official language very well. So I was glad to find an exception. Soon our family will have a car to drive around : the paperwork for our car and our Nigerien drivers licenses is in process. I may not need to take many taxi rides after that. But, then, I may do it anyway, because it’s just plain interesting. Then again, driving around this city will certainly be interesting…just in a more stressful way, I imagine. Either mode of transportation promises many more stories to come. Soon our family will have a car to drive around : the paperwork for our car and our Nigerien drivers licenses is in process. I may not need to take many taxi rides after that. But, then, I may do it anyway, because it’s just plain interesting. Then again, driving around this city will be plenty interesting…just in a more stressful way, I imagine. Either mode of transportation promises many more stories to come. One of the hardest things psychologically for me so far about life in urban West Africa has been taking out the garbage. I feel a little bit silly saying this, but it’s true. If you’ve ever walked the streets of an African city, you are probably thinking What do you mean? People just throw their garbage in big piles by the street! That’s exactly what’s hard for me. Every few days, I have walked down to neighborhood garbage pile and tossed our household waste onto the heap. And every time I do it, I find myself glancing around nervously, just waiting for an ecologically concerned fellow citizen to give me a condescending glare, or for a policeman to show up and hand me a fine for littering. Coming from my home culture, it just does not feel right. I have sorted my garbage with diligence all my life. As a child, because I knew that when we made a trip to the recycling center, I would get a few dollars in my pocket; As an adult, because I was passionate about caring for God’s creation. And as a city dweller on the west coast of the U.S. (and, later, in France) responsible waste handling was easy and efficient: you just drop things in the right container, then roll the container out to the curb on the appropriate day. The city takes care of the rest, recycling or composting as many materials as possible, then compacting and sealing the rest into a landfill, away from the space we live in. Sure, it’s true that North Americans produce far more waste per capita than the rest of the world’s population. But two things that pretty much everyone in the U.S. has heard at some point in our lives are: “don’t litter” and “recycle.” So, when there’s no straightforward recycle option available (maybe I’ll eventually find the right person to give stuff to for it to be repurposed or recycled, but I haven’t yet), I’m left breaking the two basic rules of waste disposal at the same time, as I toss a bag full of garbage – some of it recyclable – onto a pile on the side of the road! Of course, I’m talking about my experience and feelings right now. The truth is that there’s a lot of sorting and reuse going on that happens in a different way. For one thing, there are always animals digging through the garbage piles by the road. Anything edible thrown in those piles is bound to be found and eaten by the goats and cows foraging in the garbage pile. In some spots on the dirt roads in our neighborhood, people are tossing their garbage strategically in low places in the road to make for a smoother drive. And since everything is just sitting out in big piles by the street, who’s to say that the old adage about one man’s trash being another man’s treasure doesn’t result in more reusing than meets the naked eye? It sure helps me feel better, though, when I know that what I’m throwing out is going directly to an appropriate place. I’ve found that all our food scraps are welcome just down the street, with the neighbors who do not mind giving their sheep and goats exclusive access to our food scraps (no rummaging required). Also, someone tipped me off that there are boys in our part of town with blue carts who can be enlisted to come pick up one’s garbage periodically. They will then sort out any containers that could be sold for reuse or recycling. Maybe soon I will have my materials collected and sorted. At least then, whatever gets thrown in the neighborhood trash heap will be thrown in by someone else’s hands, not mine. The net result may not be a lot better, but, well, at least it will feel better.